Visit the state park and historic site for a full day’s worth of fun, adventure, and history. See American Bison, hike the nature trails, go for a swim and take in the full beauty and experience of Stonewall, Texas. The state park sits on over 700 acres and opened to the public in 1970. It represents the history of the three main cultures who had an impact locally - the Spanish, German, and Native Americans. The state park is full of fun and exciting things to do! Visitors should plan on spending a full day on the grounds to make sure they see everything there is to see. Visitor Center - The best visit to the state park and historic site is to start at the Visitor Center. 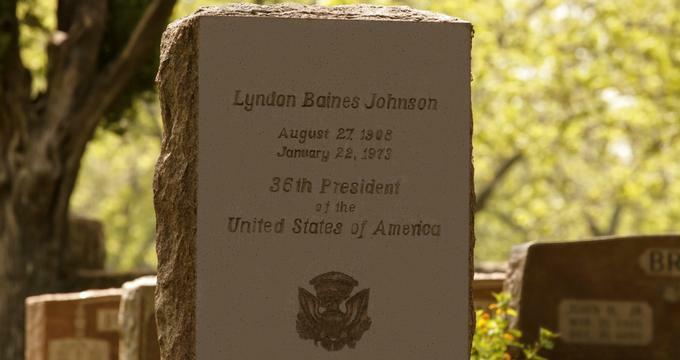 It is the focal point of the grounds and features memorabilia from President Lyndon B. Johnson’s time as president as well as interactive exhibits about the people and the land that made him who he was. There is also a 234 seat auditorium that shows films and also state performances. Behrens Cabin - The Behrens Cabin is attached to the Visitor Center. This two room dogtrot (also known as breezeway) cabin was built by a German immigrant to the area named H.C. Behrens in the 1870s and it is furnished with historical accuracy. Danz Cabin - Also just to the west of the Visitor Center is the Danz family cabin, built in the 1860s. This cabin features exhibits on the history of the local immigrant community. Historical sites - The state park has a few historical sites for guests to check out while visiting. One of the most popular is the Sauer-Beckmann Farmstead, which is considered a “living history” site and farm. The farm is available for the public to visit and is presented to historical accuracy as it would have been run in 1918. All staff wear period clothing and go about their daily chores and routines in between taking visitors on tours of the premises. Hiking/Nature - One of the best parts of the park is the natural beauty. Highlighted by a nature trail with a botanical exhibit, there are many other trails that wind past wildlife enclosures (bison, turkey, deer, cattle) as well for guests to try. The park is also the home of the Official Texas Longhorn Cattle Herd! Swimming - Swimming is allowed while in the park (for instance, in the Pedernales River) provided visitors follow the following safety tips as well as any posted warnings : Keep a close eye on children, be aware of surroundings, stay hydrated, don’t swim alone, consider currents, and only swim in designated areas. Most importantly, have fun! The park and historic site are both great educational opportunities for student field trips. They allow teachers to get the students out of their classroom and routine and into experiencing their subjects in real life. Students can take tours of the Sauer-Beckmann smokehouse and farm grounds (including the Victorian home, log house and garden). These tours last about an hour in length. The website also features a diverse variety of educational resources for teachers to help lesson plan. The park can be contacted for additional resources, information, and to plan visits. They also participate in Project WILD, which was designed for teachers from kindergarten through 12th grade to use to help incorporate wildlife related activities and learning experiences into all types of curriculum - science, math, social studies, etc. It is recognized by the TX Education Agency and Advisory Committee and both meets and exceeds state and national guidelines and standards. There are some special events held on the grounds of the park and historic site. The website keeps an up to date calendar and is a great spot for visitors to start at when looking for events happening during a planned visit. Start the year off right with a First Day Hike at the Lyndon B Johnson State Park. This hike is led by park rangers and meets at the Visitor Center the morning of New Year’s Day at 9:30 in the morning. It is approximately one mile in length and is an easy and casual hike. The trail winds past the longhorn cattle and American bison herds. It is recommended for visitors to bring binoculars, as it is a great time of the year for birdwatching. The trail also goes past the Sauer-Beckmann farm. Wear closed toed comfortable shoes and bring plenty of water. There is no charge.